Announcements in Yorkshare provide a way to communicate with your students that is both quick and effective. All Yorkshare module sites have an Announcements page available by default. Announcements are emailed to students with access to the module site via an automated queueing system, which sends the email within about 20 minutes after the announcement is posted. Students are able to choose whether they receive a separate email per announcement or a daily digest of all announcement emails. However, as shown in the video above, you can tick the option to send the announcement immediately if it is an urgent message and this will bypass any individual settings your students have and send the email straight to their inbox. 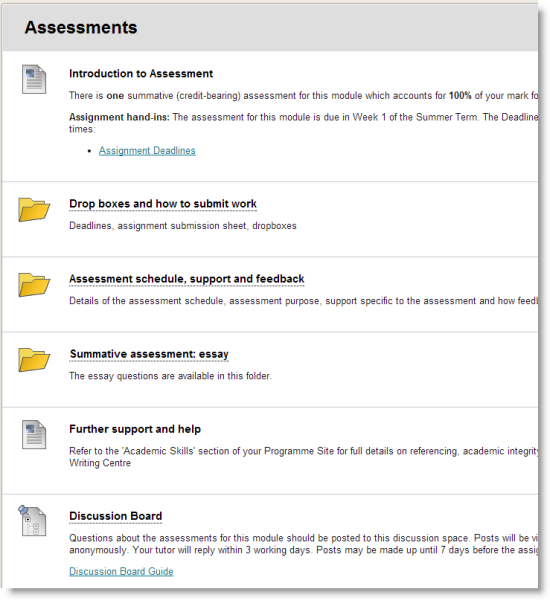 The module outline presents the aims and learning objectives for the module. It is an important document that contextualises the module within the programme and can hold indicative reading, list lecture or seminar topics, indicate the types of interactions students can expect and the format of assessment. Link this document clearly from the left menu within your module site. Signpost to other parts of the module site where relevant, for example if the reading list is provided by the Library’s “Reading Lists” tool and is available through another left menu link. 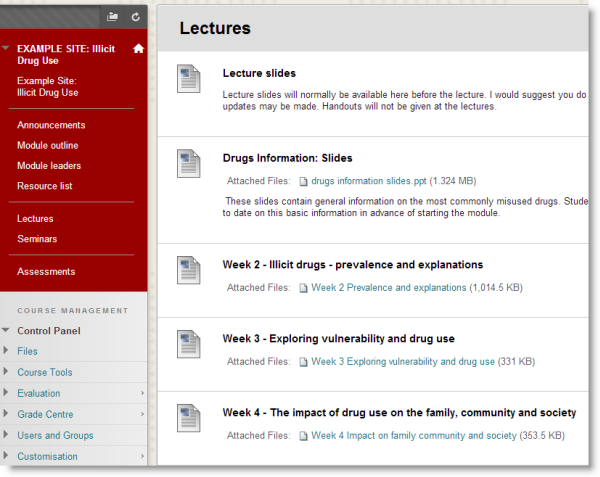 Course content will be dependent upon your module structure and teaching approach. Consistent labelling across a programme will bring coherence to your Yorkshare sites, enabling students to get to the content quicker. Yorkshare is the first point of contact students will have with course content, therefore titling and labelling content appropriately will support students’ understanding of the structure of the module and connections between content. Include references to the term week number and topic to reaffirm the link between the Yorkshare materials and face-to-face teaching. Files that are uploaded should have meaningful filenames. For lecture slides, this will include reference to the module title and topic of the lecture. For readings, this will include reference to the module title and the author of the reading. This is a basic accessibility adjustment that improves usability for all students, but is essential for students who use screen-reading software so that they can get to the content quicker. Section 3 of the York TEL Handbook provides guidance on types of content in more depth. You should also be familiar with key accessibility guidelines. Lecture slides, including how and when they will be available. Lecture, seminar, workshop, lab titles. The University Library now manage reading lists through a system simply known as “Reading Lists”. Reading Lists replaced EARL in 2017. Reading Lists is integrated into Yorkshare, so students are able to access key texts and additional readings through links to catalogue details, e-books and articles within the same space as their course content. Reading Lists can be arranged with different lists separated by week or topic to provide better structure and improve visibility of key texts. Learn more about Reading Lists. Contact your Academic Liaison Librarian or email lib-readinglists@york.ac.uk for all Reading List queries and to arrange individual training. University Library Resource List Policy. Provide information about the method of assessment, marking criteria and how feedback will be provided (consider both formal and informal/class-based forms of feedback). Your Department may also be using online submission points, and these should be linked within the module. Clear assessment information is particularly important for students on joint programmes and elective modules, as assessment processes may be different between Departments. Section 6 of the York TEL Handbook includes online assessment workflows for formative and summative work, and approaches to assessment and feedback using Yorkshare or other supported tools. 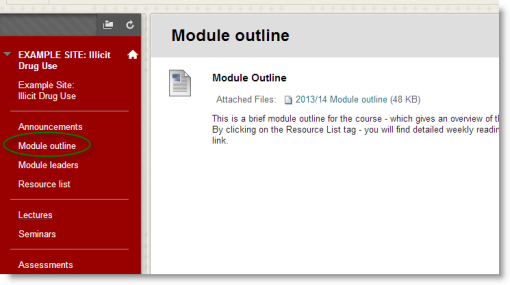 Include contact details for the module lead, lecturers and lab/seminar/tutorial staff as appropriate to your module. Within Yorkshare more widely, contact details for key administrative staff will help students get to the right person if they are having difficulty accessing sites, content or submitting work. Different staff will have different preferences over how and when students should contact them. Set clear expectations with students within Yorkshare module sites. Contact me for questions about the module structure, assessment requirements, absence. Preferred contact is by email in the first instance. You are welcome to attend my drop-in office hours without prior appointment. Office hours (term-time only): Monday 4pm-5pm, Wednesday 12pm-1pm.